Young Gods 2012 occurs at a significant time, the art school experience is currently in a state of flux operating with higher tuition fees, larger class sizes and less studio space. New models of education and professional development for emerging artists are being established outside of the university model and the severe consequences of excluding art from the Ebacc are indisputable in its long-term impact on the education of future artists. Young Gods is an annual exhibition showcasing the work of graduating students selected and curated by Zavier Ellis, director of CHARLIE SMITH London, this year’s exhibition simultaneously taking place in locations in the east and west of the city. In this uncertain climate for art schools, where ‘best of’ shows could soon be a relic of a previous era, it was difficult to predict what an exhibition of the most outstanding works by recent graduates would look like. The Griffin Gallery, supported by Winsor and Newton, focuses on artists working in what it defines as ‘traditional media.’ Consequently painting features predominantly in the west London venue where there is an overwhelmingly display of engagement with materials. Steven Allen’s The Faithful Companion is a clash of physical painting and absurd narrative, picturing a peculiar domestic ritual – a banana brought to life in human form, bathing with a dog. It is one of the more whimsical pieces on show although the sensual application of thick paint tells us there is something more serious about Allens’ engagement with the process of painting than the absurdity of the depicted scenario suggests. Sikelela Owen’s gracefully painted Untitled (Kilburn Lounge) and Laying (Lindelwe) offer a distinct contrast to the jarring boldness of Allen’s colour palette, in which muted traces of brush marks in washes of oil paint are left visible, describing loosely rendered figures in sedate positions. They are delicate, honest paintings suggesting moments of close familiarity amongst friends or family groups. The exhibition aims to showcase London’s most exciting and forward-looking talent. It is therefore somewhat surprising to find a shared sense of retrospection in many of the works. Andrew Leventis paints scenes from photographs of period dramas screened on television. Melancholy and intimate, he presents a dreamlike vision of the past as seen through the conduit of the contemporary digital screen. Skillfully rendered across four small paintings Sheila Wallis depicts archival scientific subject matter with arresting photorealism. Her restrained approach to the images’ content and adroit application of paint creates monochromatic windows through which to glimpse an earlier time in scientific history. The world Wallis portrays is controlled, clinical and chilling. A more playful acknowledgement of the past is provided by Peter Georgallou, who explores a pre-technological world and the purity of a bygone spirit of invention untouched by digital intervention. Georgallou’s practice embraces both art and real life experience, where he undertakes challenges of physical endurance and engineering, to achieve often-impossible goals. The performativity of the work is ambitious but this is sadly not shown in the exhibition, although Georgallou’s bicycle powered loom, Hark yonder the third horseman cometh over the horizontal, makes an impressive centrepiece to the east London show. The work of both Adele Morse and Jessica Rayner is typified by a research-led position. 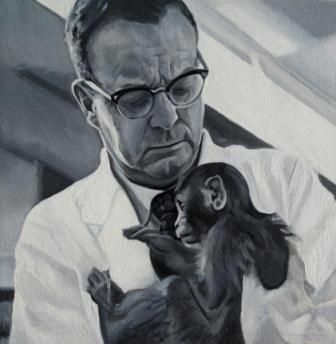 Morse’s work focuses on investigations into the existence of the Orang Pendek, a creature whose existence has never been scientifically proven. In the projection oh Brother, where art though? found film and sound footage that supports the existence of the Orang Pendek is collaged together, revealing itself as a more convincing illustration of contemporary information culture than it is of the existence of the cryptid in question. It is perhaps one of the works in the exhibition that best reflects the digital age – obsessed with sound bites and as convinced by sensationalism as it is by truth. Rayner’s work is more arresting in its subtlety, the results of global expeditions undertaken by the artist to uncover stories of ecology and humanity. Prohibition of Death in Response to Environmental Conditions, a written text and a duratran print presents an evocative meditation on the passing of time and the power of the natural world in the face of human intervention. The focus on materials in Young Gods 2012 largely champions skillfully executed figuration. Offering a different perspective on visual outcomes are Christopher Kulendran Thomas, Eyal Edelman and Salome Ghazanfari. Kulendran Thomas’ When Platitudes Become Form encourages a challenging dialogue with material form and what it represents. Art objects sourced during trips to Sri Lanka are reconfigured in a gesture of western postmodernism to create a mash up of cultural iconography, market importance and aesthetic taste. The work feels exploratory and spirited. Similarly, Eyal Edelman’s performance Everyone’s a Critic features live feedback on works from visitors to the exhibition openings. The unpredictability of responses makes this the only work in the exhibition where chance plays a part, in an exhibition of otherwise highly controlled, composed work. As such what Everyone’s a Critic lacks in achieving the convincing visual outcomes of the other works, it makes up for by adding a less rationalised sensibility to the exhibition. Steel Alive, Salome Ghazanfari’s digital print on paper taped casually to the wall, presents an enlarged photographic image of a text from a drug dealer. It has a raw energy and connection to the street. The work appears fresh and temporary – like culture itself. Young Gods 2012 offers a more elegant and restrained survey of graduate work than its ostentatious title suggests, surprisingly characterised by traditional academic values such as scholarly research and a mastery of materials. As a view of ‘London’s most exciting recent graduates’ it provides a strong selection of work by emerging artists, whose passage from art school sees them armed with advanced intellectual properties and practical skills. However, what is partly lacking from the show is the sense of audacity or defiance of convention that might be more expected of young artists. Zavier Ellis has selected accomplished, thoughtful work for Young Gods 2012, which is perhaps at points a victim of the uncertain cultural context in which it is made – retrospective and careful. There is a notable absence of work that explores technology and the virtual world, or that challenges the conventions of the art object. The exhibition does, however, present a positive view of the quality of work being made by graduate artists, and the resilience of enduring intellectual and practical skills in a time where art school teaching is under threat. 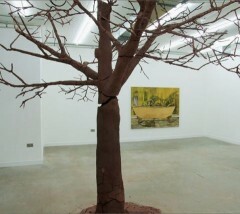 George Rae’s Quercus Robur, an unfired terracotta sculpture of an oak tree created in the Griffin Gallery has a transient existence, the clay drying and cracking as time passes. Rae sees it as a metaphor for the loss of craftsmanship in contemporary art yet the work is also an enduring image of the wider context of the exhibition, a metaphor for the fragile state and uncertain future of arts education in Britain. In the meantime Ellis succeeds in presenting an encouraging image of the art emerging from London art schools, and as such we must continue to hope that Young Gods 2012 is not the beginning of the end for graduate showcases.